The public name of the survey will appear as a banner headline atop the page (in h2 HTML style). Inspire the page's visitor to take the survey, or give any directions that might be needed. This field appears on the signup page after the Title, and can be HTML-styled using the WYSIWYG editor, including images, links, and video embeds. The Supporter Info tab lets you determine what core supporter information you'll be collecting when someone signs up on the page. (Distinct from the survey questions you'll set up in step 6. Add more fields, including custom fields, by clicking the button with the plus symbol and selecting the new field from the drop-down menu. In addition to collecting supporter data, you can optionally have people who take the survey sorted into different Groups, or subsets of your list. If you don't want the survey to group supporters, just skip this section. If you do want survey-takers grouped, set it up here with two easy steps. 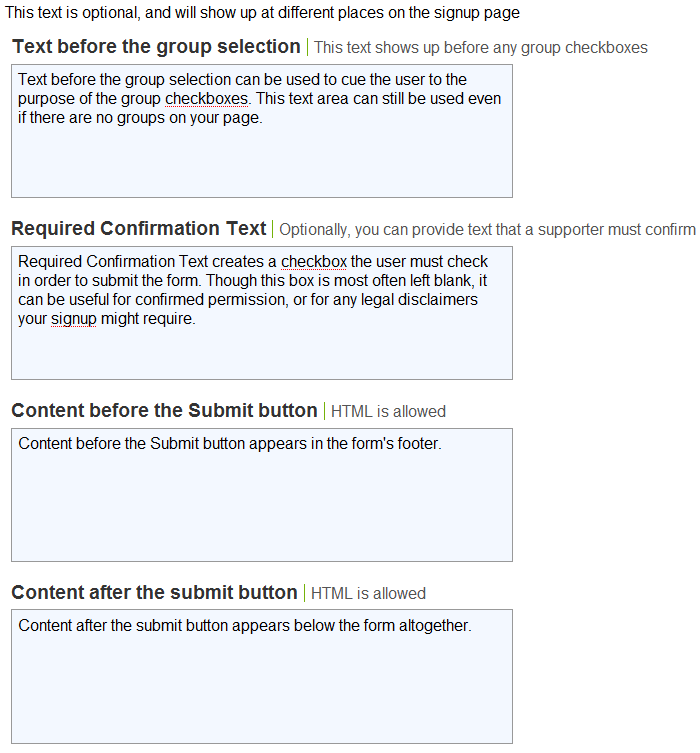 If supporters are allowed to opt-in, all selected groups appear on the signup page as checkboxes which supporters will be able to self-select. This is a handy way to use the signup page for populating multiple regular email lists. If supporters are automatically added to groups, groups are not visible on the public-facing page, but supporters will automatically be added to them upon signing up. You might use this if the survey exists to register people for one specific list, or if you want all people who take the survey to be placed into a permanent segment for tracking. 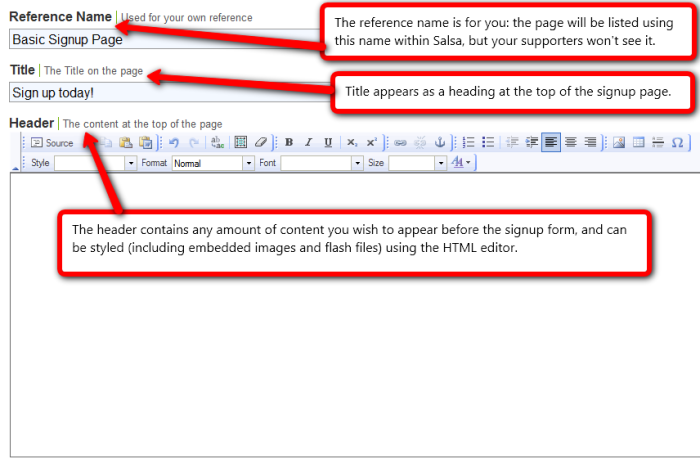 Second, click the magnifying glass icon to pick one of your existing Salsa groups for the page. To involve multiple groups, click "Add a group" and repeat the process. 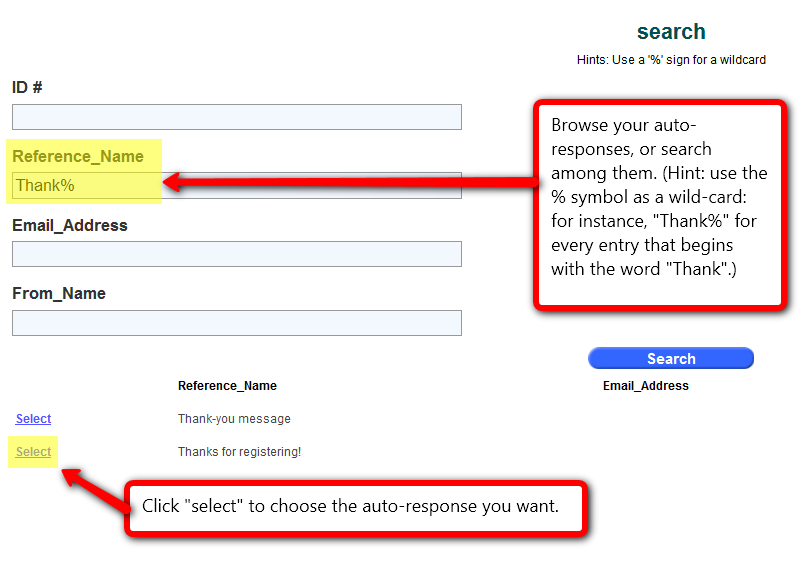 (See images 3a-3b) Click "Remove" to disassociate any group from the survey page. There is neither a minimum nor maximum number of groups that may be associated with any given page. The Other Text tab allows you to insert some additional text at various places throughout the survey page. None of these fields are necessary for the page to function, and there's nothing wrong with leaving them blank. What they offer is the ability to fine-tune the appearance and presentation of your page. what emails (if any) are automatically launched by the survey's completion. This field allows you to specify the web address to which your registrant will be redirected after completing the survey. This could be your website’s homepage, a donation page, a tell-a-friend page, or literally any other page on the web. You could even use Salsa's Website Management tools to design a special landing page with a specific thank-you message for the survey. "Autorespones" or "Triggers" are email messages launched as a result of someone completing the survey. Though Autoresponses are optional, they are highly recommended; someone taking time to complete a survey to help you deserves an acknowledgment. 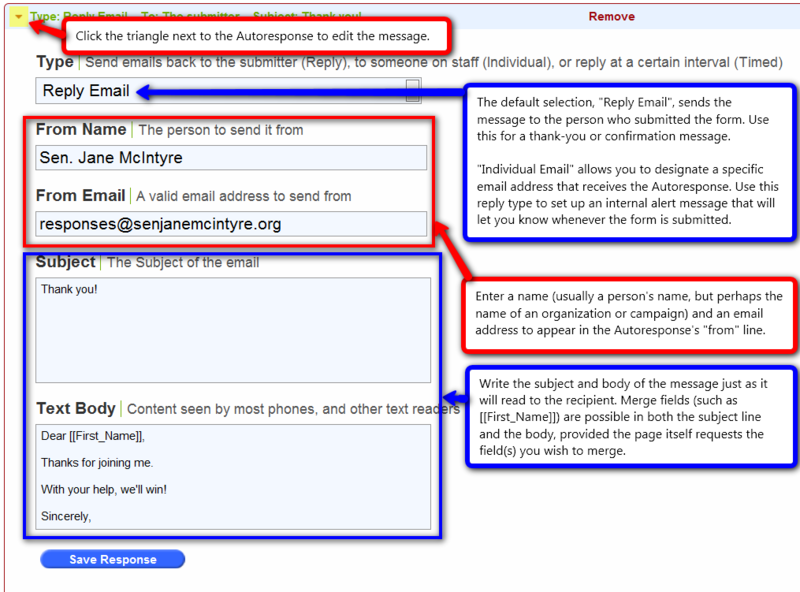 Additional Autoresponses (there is no limit to the number of Autoresponses a page can launch) can also be used to email an alert to someone in your own organization, so you'll know immediately whenever someone takes the survey. Use this section to build and configure your page's associated Autorespones. You can configure any number of Autoresponses, in any combination of new and existing Autoresponses, on each different page. The Options tab presents a variety of features to extend your survey's functionality. Whether and how to use these options may depend greatly on the specific operation the page is intended to support. 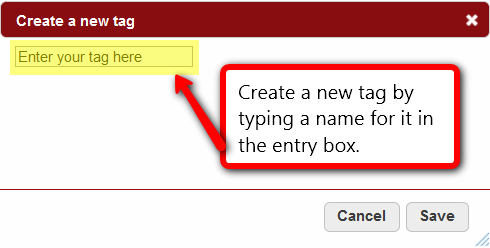 Tags, like the Groups you can configure in Step 2: Supporter Info, enable you to segment your list. You may select as many tags as you like from the menu here. (Hold down the ctrl or Apple button to select multiple tags, or to de-select individual tags.) Any tags selected will be applied to any supporter who takes the survey, facilitating easy retrieval and targeting later. These tags are not visible to your supporters. If checked, this box causes a set of volunteer availability fields to be requested on the survey page. "Do not add without confirmation" will require a double-opt in by any new supporter to actually join your list: after signing up by filling out the survey, s/he will have to confirm by clicking a link in an email message. If you click this box, you must set up the email confirmation messages as a trigger. Salsa will not do so automatically. It is not to be confused with the "Confirmation Box" in Step 3: Other Text, with which "Do not add without confirmation" may be (but need not be) used jointly. Maximum field width enables you to control the span of input fields. You may want to use it if you have a narrow template. The survey questions tab enables you to customize your form with one or more additional survey questions. These survey questions are simple yes/no questions that the supporter answers by checking a box ( Image 1), thereby tagging his or her record. 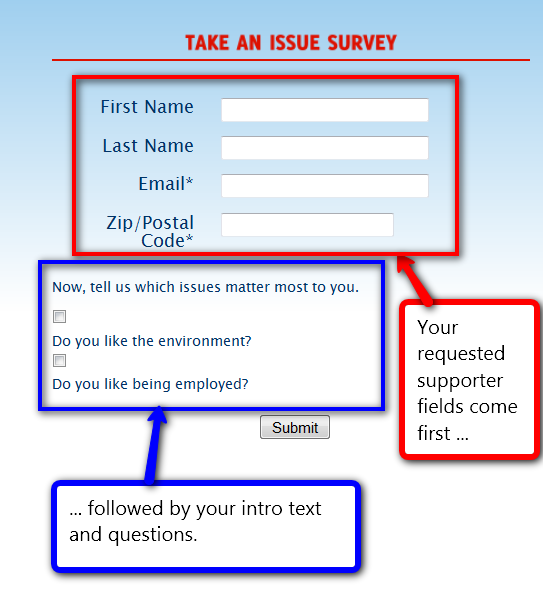 This field appears after the main set of supporter fields you have configured in previous steps, to introduce the survey questions. 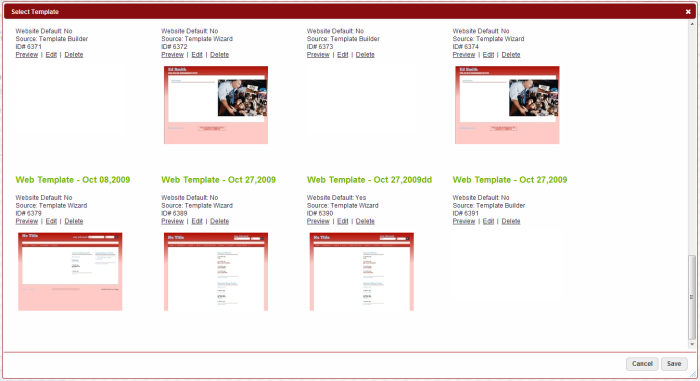 It can be HTML-styled using the WYSIWYG editor, including images, links, and video embeds. A tag associated with the question. When the respondent checks the box next to the survey question, s/he receives this tag. 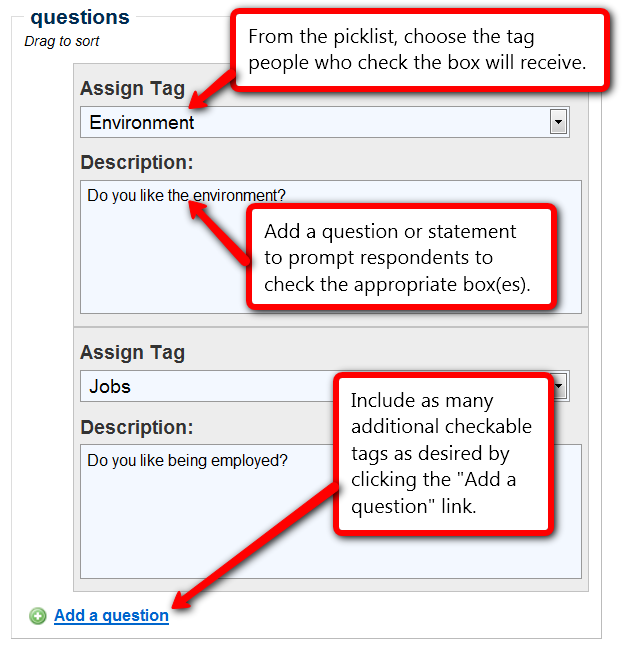 Repeat as many times as desired, using the "Add a question" link to add new checkbox questions. I don't understand where the survey tab is on the event page that I am making.